Ciao Lilli. Sai quanto io adoro questo cappottino! Delizioso questo cappottino rosa, e l'abbinamento con il grigio è perfetto! Sai che te lo dico sempre: in rosa stai benissimo, perché hai un faccino dolce da donna-bambina che con il rosa viene esaltato e valorizzato. Lilli , sei assolutamente perfetta in questo look! Wearing pink is a nice start to the week! Have a wonderful day! tenerissima con questo cappotto rosa Lilly..sei un fiorelluno. I love your outfit, Lilli! You always look so beautiful in pink! ciao Lilli! 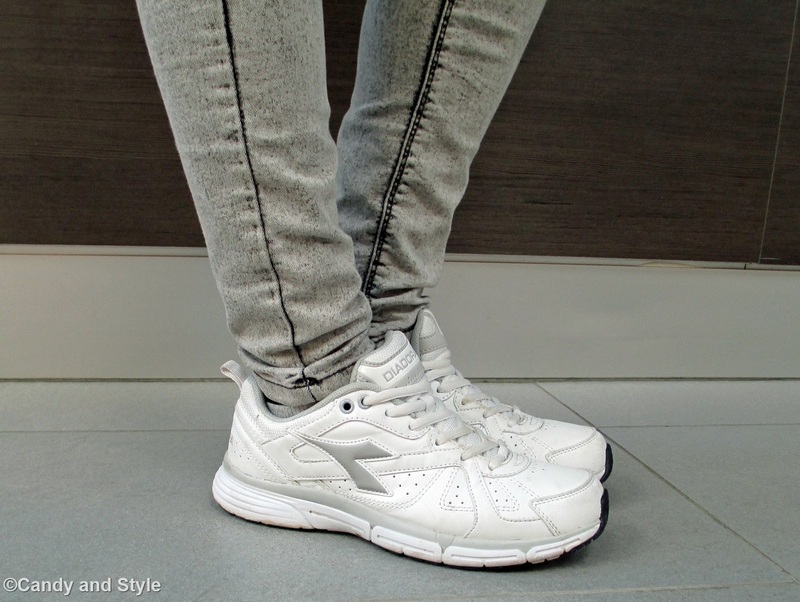 bellissimo questo look più sportivo! sai quanto adoro il tuo cappottino, e la combinazione rosa e grigia è perfetta! bellissimi gli orecchini a rosellina! Sono co il tablet e per scorrere ho puntato il dito sul cappotto...ho lo smalto dello stesso colore LOL!!!! E poi vedi il grigio è sempre un pò tetro invece con il rosa diventa allegro! Io spero che la tua settimana possa essere splendida come te con questo capotto rosa che trovo stia benissimo abbinato al grigio (è uno dei miei mix preferiti). Spero che questo periodo un po triste per te passi alla svelta, te lo auguro col cuore. Lovely combo, especially the pants ver y comfy and trendy, happy weekend Lilli! I love a soft pink, paired with grey. It's just so pretty on you Lilli! Love your butterfly scarf. What a lovely Spring outfit!!! You look so preety in your pink coat!!! I really like your sporty look!!! Have a happy and sunny week dear!Hugs! Ma che bella che sei Lilli. Il rosa ti sta benissimo e adoro la sciarpa che indossi! Mi piaci tanto vestita in rosa.... troppo cool questo look!!! Auguro anche a te una settimana soft & easy!!! Lilli, I'm fond of Tezenis after I bought some items there in Italy. I've wanted to see how your Tezenis sweatshirt look like but it is covered up in this photo.Pink reminds me of you as usual and my favourite are the reddish mango aviators. Would you like to connect personally on Facebook via our own private account? I'm already following and liking your main public page. I've recently connected with Kim and Kizzy on Facebook and and have been connected with Sany, Ali and a few more for quite a while. And I would love it if we could be FB friends too since you're also one of my favourite people on blogger. Do let me know! Adoro il rosa abbinato al grigio, credo di averlo detto più volte. Mi piace perchè lo trovo un mix raffinato che esalta entrambi i colori e non ne fa predominare nessuno! Nice outfit!!! I love your coat!!!! Morning Lilli! You're looking cute as always and as you already know, I'm a huge fan of your pink coat, it just looks so sweet on you. May I ask what are your thoughts on the Maybelline SuperStay 14Hrs lipsticks? I have sen it but never tried it for myself because I'm worried that it would be very drying. I like this comfortable look! I made the mistake to travel with heels last weekend. Not a good idea; trainers are always the better option! Your Outfit is a great inspiration and i love all the details, like the scarf or the little roses in your ears. Very cute. Un abbraccio per te. adoro il grigio e rosa insieme! Stai benissimo con questo cappottino, lo adoro! Questo cappottino è troppo bello Lilli e poi sta bene con tutto, perfetto con le sneakers! Hope you'll have a wonderful week, dear! The biggest hug for you, Lilli! I love the combination of femininity and sportiness in this look Lilli! The style is just so perfectly you and you wear it beautifully! Love your crossbody bag too! The style and color are gorgeous! Have a marvelous week sweetie! I hope your week will be a sparkling one Lilli, and relaxed, good vibes only! Amo il colore di questo cappotto ! You look like a kid and that baby pink color gives a calm feeling. I have that earing (peach) to match a peach top I like. Bellisima Lilli, happy monday you to!! 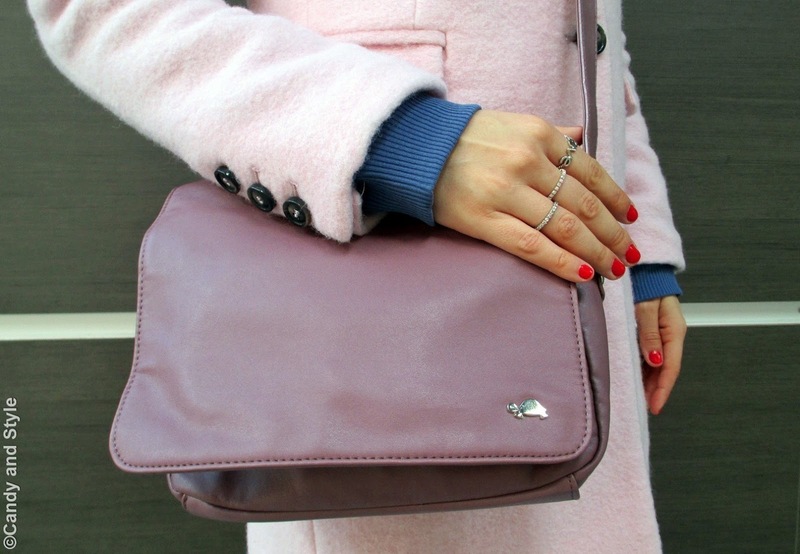 The pink coat are so sweet, love it!!!! Love Pink pink on you doll! Hope your week is being going great!! Hi Lilli! 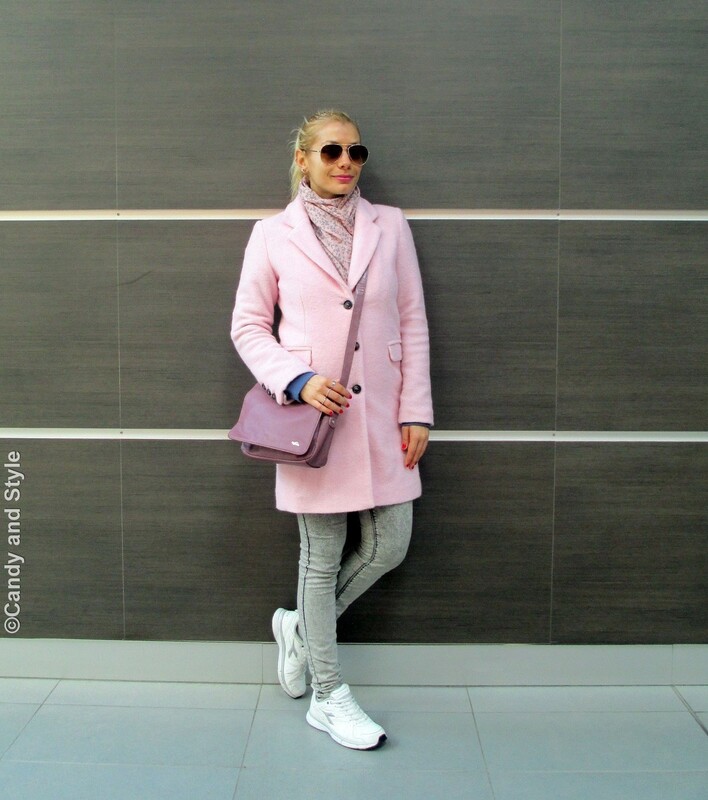 Such an awesome look, I adore your coat so much.. anything pink looks good on you and the scarf is so adorable too :) Loving the touch of sporty look, I never knew those shoes can look good with a coat, and they do, very clever style :) Definitely super chic! Hope you're having a fabulous week. ammetto che sono stanca di cappotti ma questo lo adoro proprio! Dear Lilli, the coat is beautiful, love the masculine length, a great balance between feminine and masculine, comfy and chicness. Happy WW!